A-6 -- Democrats tried to humanize 2 the egg-headed Adlai Stevenson by presenting him as “The Man from Libertyville,” a Chicago suburb. B-2 -- Al Gore was born in Washington, DC -- his father was a congressman and later became a senator -- but Gore would spend summers and holidays in Carthage, TN 3, where he also launched all of his campaigns. C-11 -- Kansan Bob Dole hails from Russell, KS, and he would mention it often. ``You notice almost everything he talks about, he always gets back to Russell, Kansas, in his speeches,'' his late sister, Norma Jean Steele, told 4 the Philadelphia Inquirer during Dole's 1996 presidential run. E-8 -- Not only did George McGovern grow up in Mitchell, SD, but he attended Dakota Wesleyan University there as well, and the school now is home to the McGovern Center for Leadership and Public Service. F-5 -- Harry Truman's down-home appeal came in large part from his Missouri roots -- he was born in Lamar and grew up in Independence, a well-named town for a future presidential candidate. G-14 -- While he was elected as a senator from Minnesota, Hubert Humphrey was born in Wallace, SD. H-10 -- Both Jimmy Carter and his wife, Rosalynn, hailed from tiny Plains, GA. The Peach State supported its favorite son even at his lowest point -- Ronald Reagan swept the entire South, except for Georgia, in his 1980 defeat of Carter. I-12 -- By our conservative estimate, Joe Biden has referenced his upbringing in Scranton, PA, approximately 102,614 times while in public office. Just kidding, but it sure seems that way, right? J-7 -- Just like Biden, John Kasich grew up in Pennsylvania while making his political name elsewhere -- Biden was elected to the Senate from Delaware, and Kasich was elected governor of Ohio. Kasich, as he often notes 6, was born in McKees Rocks -- a Pittsburgh suburb -- and is the son of a mailman. 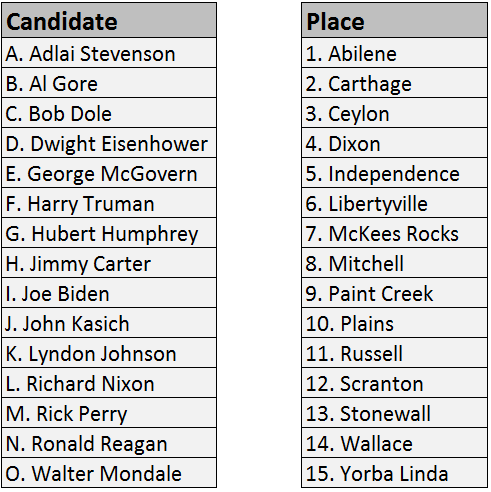 K-13 -- LBJ grew up in rural Texas along the Pedernales River, a well-known feature of his biography even if his place of birth (Stonewall, outside small Johnson City) is not. L-15 -- Yorba Linda, birthplace of Richard Nixon and home to his presidential library, is in Orange County, CA -- one of just a handful of the nation's most populous counties that still consistently votes Republican for president. N-4 -- Though he was born in Tampico, IL, Ronald Reagan considered his hometown to be Dixon, where his family moved when he was 9. O-3 -- Walter Mondale was born in Ceylon, MN, though he also lived in another small town, Elmore, which he cited by name in his 1984 speech 8 accepting the Democratic presidential nomination.